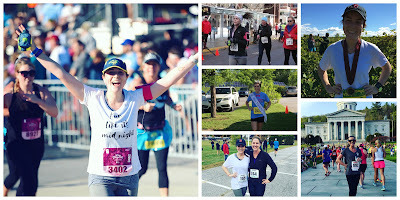 Remember when from May to March I ran three 5Ks, one 10K, and two half marathons? And by some weird and wild miracle I didn't die? Well, here is how that happened. First of all, you might remember that last year (well, May of 2015) I ran my first Corporate Cup 5k (also known as my first official road race ever.) So naturally, I decided to do way more the following year. Right? So that meant in May, just weeks before being crowned Miss Vermont, I ran the Vermont Corporate Cup 5K, again. Didn't die! Then, in July, I ran the Komen for the Cure 5K. And proceeded to have another few hours of an appearance afterwards - one of my greater accomplishments, honestly. In September, two weeks after Miss America, I ran my first 10K. At, truthfully, the most gorgeous course I've ever been on - the Island Vines 10K. Then, just one week later I ran my first half marathon. Also known as one of the hardest halfs in Vermont. (Leaf Peepers Half in Waterbury, p.s.) Ha. Ha. Ha. Anyways, after all of that, I survived, I loved it, and I knew, all the way back in July, that I wanted to run the Disney Princess Half Marathon. For a few reasons, beyond liking the idea of running 13.1 miles. First of all, it's billed as one of the best half marathon courses out there - and almost anyone who has run it will tell you it is hands down the most fun. Third of all, for the Disney Princess Half, runDisney partners with Children's Miracle Network Hospitals. Imagine that. And traditionally that means that Miss America is present, as well as a handful of other titleholders. So, I kid you not, I was sitting at a table in D.C. during Miss America Orientation. Literally, across the table from our then Miss America, at one of the swankiest little boutique restaurants in the city, and I signed up for my second half marathon. Without even having run my first. You might say I've taken quite well to running. Now, I'll be the first to tell you, I am not fast. Not even kind of. And running the Disney Princess Half was going to be no exception. The reality is I have a lot of jobs, a lot of responsibilities, and I knew that this race wasn't really about time. Put it this way, out of the 37,000 people that were in Walt Disney World to run that weekend, I would wager that maybe 1,000 of them were serious-Boston-Marathon-style runners. Most people run in big elaborate costumes. Most people go to the dozens of picture sites - where you are encouraged to stop, meet a character, and pose. This isn't a marathon you do to prove that you can run a sub 8 mile. It's just fun. It's running through the most magical place on Earth as the sun rises. Well...unless during mile 7 your foot gives out. Mhm, about half way through mile 7 - by that time, by the way, I was doing great. I had good mile splits, I was having fun. It was great! Anyways. About half way through mile 7, all of a sudden, my right foot was done. I don't really know how to explain it, I didn't land wrong. I didn't twist anything. But there was a deep precise pain, right in the bottom center of my foot. And something just clicked. I knew that the it was not going away. Like any idiot runner though, I kept going. I was able to jog through the rest of mile 7, and 8. Then I about walked through 9 and half of 10. And hobble/jogged through the last 3. And embarrassing. Until I reminded myself that this was my second half marathon in less than six months. Who the hell could fault me for a dang broken (I had come to the conclusion around mile 11 that it was a stress fracture, was later proven right, thankyouverymuch) foot? And I realized, I would do it again, in a heartbeat. Even with a bum foot. Even without training as much as I should have. Because it was amazing. So yes, I'll be running part of the Vermont City Marathon in May, probably another half in June, and definitely another couple of 5 and 10Ks. Because why not, right? I can't guarantee I'll be fast, or that I'll PR any races. I do know I'll enjoy it. I'll embrace it. I'll keep doing it. Because I tell you what, there is nothing like seeing the huge smiling face of an oversized rodent at the end of 13.1 miles.